Rendering of Pulse, a public art project that will convey real-time public transit information using columns of atomized dry mist. 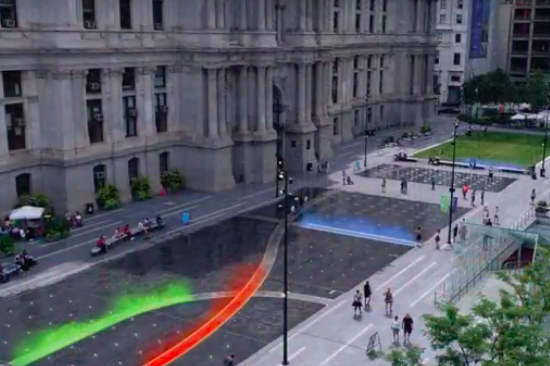 An infusion of grant money for a long-planned art project will soon deliver streaks of colorful mist to the fountain at Dilworth Park in Center City. And it will be controlled by the real-time passage of SEPTA subway and trolley trains underground. The Center City District Foundation announced Monday that a $325,000 grant from the William Penn Foundation will fund the completion of the green line portion of Pulse, a public art installation conceived by internationally recognized sculptor Janet Echelman. Described as "a living x-ray of the city's circulatory system," the site was selected as an homage to Philadelphia's first water pumping station at Centre Square and the steam that once billowed from trains at the Pennsylvania Railroad Station across the street. Echelman, a recipient of the Guggenheim Fellowship and the Harvard University Loeb Fellowship, was commissioned to conceptualize the project in 2010. Significant infrastructure was embedded in the park's fountain at the time of its construction in 2014, according to Center City District president Paul R. Levy. As SEPTA subways and trolleys pass through the transportation hub. Pulse is engineered to project four-foot-tall curtains of atomized dry mist across the park's fountain. In July, the installation will debut with green mist corresponding to SEPTA subway-surface trolley lines. Eventually, there will be orange mist for the Broad Street Line and blue mist for the Market-Frankford Line. “Dilworth Park is a public space that serves people from all neighborhoods, and Pulse will offer Dilworth Park’s diverse group of users and audiences an opportunity to engage with art that is innovative and interactive," said Judilee Reed, program director for Creative Communities at the William Penn Foundation. If you're going to be a couple of minutes late for your train, at least Philadelphia is making sure you get a colorful display of mist for your troubles.